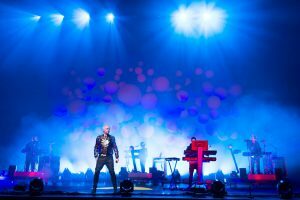 Neil Tennant and Chris Lowe broke new ground when they formed the Pet Shop Boys and recorded West End Girls, more than twenty years later they still want to connect with people. The Pet Shop Boys have a reputation for saying no. No to awards ceremonies, to celebrity, to making anything that might sound like boring rock music  and with their tight-lipped, scowling publicity shots, no even to smiling. But after 25 years, the British pop duo  the most successful duo in pop ever  seem to have taken on a new glow of Obama-inspired positivity. Last month they accepted a Brit award for outstanding contributions to music in recognition of more than 50 million records sold worldwide, handed to them by a gushing Brandon Flowers from the Killers. This week their new album is out, appropriately called Yes. It narrowly missed hitting number one, on a technicality, and is being hailed as a magnificent return to form. They are even being chatty and smiley as they sit in front of me, on a gloriously sunny day in a hip east London members club  without sunglasses. With their still, soft Northern accents and endless jokey banter, they are less like the terrifying Gilbert and George of modern music than a cuddly Wallace and Gromit. What happened? Indeed, the recipe conjured up in early Eighties London, when Tennant, the Smash Hits journalist from the North-East, crossed paths with Lowe, the architecture student from the North West, in a synthesizer shop, could be boiled down to ‘Coward to the tune of modern technology’. And the results, from the very first hit they had with West End Girls, were pure pop alchemy. Sandwiched between the death throes of the New Romantics, a scowling indie underground, and the saccharine pop of Stock, Aiken and Waterman, the Pet Shop Boys sounded like nothing else. The Pet Shop Boys definition of ‘keeping it real’ is somewhat unique. Anyone who saw them on the Brits, emerging out of two giant projections of their heads  Lowe, who will be 50 this year, in a Britney Spears-style pink wig, 54-year-old Tennant in a bowler hat and bovver boots, surrounded by ballet dancers  could testify that ten albums down the line, they are still managing to be unlike anything else in pop. While other Eighties bands have broken up and reunited, or are on the nostalgia circuit, the Pet Shop Boys have continued to sell millions of records and be treated as a contemporary, relevant act. And despite diversions along the way into writing musicals, scoring soundtracks to silent Russian films, art exhibitions and currently, producing a new ballet, it is clear that Lowe and Tennant  who despite the greying hair, can babble away about music like nerdy school boys  have never fallen out of love with pop. ‘The great thing about pop music is that it makes difficult things sound natural. And anything can be brought into it. It is like a newspaper for the world,’ declares Tennant. Yet while the newspapers right now are full of fear and confusion, new album Yes, recorded with Girls Aloud producers Xenomania, is underpinned by a tiggerish mood of optimism. Not that any Pet Shop Boys record could be that simple. Among the shiny pop, there is as much, if not more, classic Tennant wistfulness, regret and subtle recriminations. This remains the Pet Shop Boys’ power  elevating and illuminating the murky complications of modern life with a relentless desire for beauty and modernity. Yet after living through three British prime ministers, four US presidents, three recessions and the life and death of a thousand other bands, it’s tempting to read the album’s final song Legacy as perhaps their swansong.